The PHCN370/371 series has been discontinued. Please see the PHCN-37 as a possible alternative or contact our Sales Engineering department. 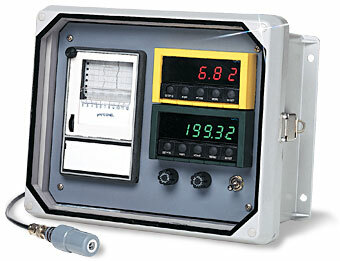 The PHCN-370 Series of pH or ORP recorders and controllers provides a reliable method of monitoring, controlling and recording pH and ORP (Oxidizing Reduction Potential) for various industrial and chemical processes. The PHCN-370 has an impressive list of standard features which include NEMA 4X enclosure, digital display, paper or paperless data logging, relay output and manual or automatic temperature compensation. The PHCN-370 series features an inkless pressure sensitive paper recorder. The PHCN-370 series pressure sensitive recorder and controller will record up to 30 days of process data. Choose between either a single or dual parameter monitoring system of pH or ORP. The pH and ORP controller is a new microprocessor based design featuring manual or automatic temperature compensation, two mechanical relays for on-off control, digital display of either pH, ORP or temperature, calibration and parameter setpoints are programmable through the front keypad. 참고: Note: for 230 Vac power add “-230” suffix to model number, no additional charge.